Understanding the intricacies of organics can help you make better, greener choices for your business. The first thing you’ll want to do is look at the bill from your waste hauler. Given the size of NYC, it’s hard for haulers to measure the exact amount of waste on a daily, or even weekly basis. Typically, everything is measured once, and then a monthly fee is determined based on that number. When adding compost collection to your recycling routine, it’s important to re-negotiate your contract. The waste hauler will charge you an additional fee for new collection; but your landfill waste should shrink significantly, reducing your bill. If you need help negotiating a hauling contract, or an opinion on what could work for you – we’re here. After a chat with your hauler, you’ll want to set up collection stations to make sure contamination is low and adoption is easy at your office. And we can help with that too. Composting extends beyond the office as well. Many nonprofits in NYC process compost locally, and depend on volunteers to help. You might be surprised by how much your employees enjoy playing in the dirt! Added Value Farm in Red Hook, Brooklyn, is a great place to get involved. You can volunteer with them yourself or plan a group outing. They’re known for their comprehensive, hands-on approach to composting. Earth Matter on Governor’s Island relies on a steady stream of volunteers to process nearly 100,000 pounds of food scraps each year from the city. In the summer of 2013, Earth Matter hosted 27 prearranged group workdays. It’s a great place to take advantage of corporate volunteer days. Check our volunteer calendar for upcoming opportunities to get involved in the composting community of NYC. Want to set up a volunteer day for your company? We can help. NYC’s commercial composting and recycling laws are changing and we’ll help you comply. In 2016, all businesses received this Official Notice from the Department of Sanitation that outlines the new recycling requirements for businesses, for items like glass, metal, plastic, paper, and cardboard. The new rules are effective as of August 2016, and noncompliant businesses will begin receiving fines in August 2017. This Commercial Recycling Booklet was produced to help businesses comply, and remember, Common Ground Compost is always here to help! Other businesses are not required by law to compost, but always have the option to do so! More info on commercial organics can be found here on DSNY’s website. 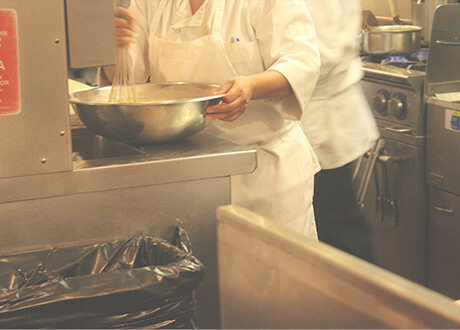 Your business may choose to utilize an on-site technology to help manage food scraps. We can help you find a technology that suits your business. Be sure to complete the Commercial Organics On-Site Processing Registration Form before launching your on-site processing operations! 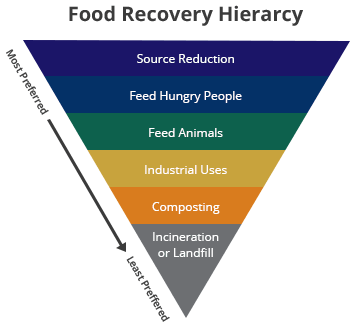 An EPA challenge for organizations to reduce as much of their food scraps as possible. Awarding participants with the most impressive accomplishments. Learn more about the challenge here! In 2012, the EPA awarded UMass Amherst in the “Colleges and Universities” category for diverting more than 80 tons of food scraps, and Lincoln Financial Field (home of the Philadelphia Eagles) in the “Sports and Entertainment” category for diverting 105 tons of food scraps. The EPA uses a hierarchy to help organizations determine the best way to reduce their waste, starting with decreasing what’s considered waste, and what can be donated.